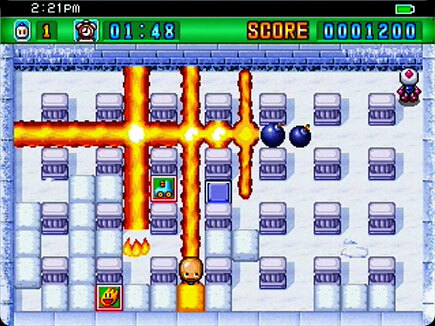 You guide the main Bomber man character through 20 levels of action, planting bombs that destroy enemies and explode soft blocks that reveal power-ups: Fire Up, which increases your bombs’ range by one block; Bomb Up, which allows you to lay down multiple bombs simultaneously; Speed Up, which accelerates your movement; and Life Up, which adds an extra life. One of the soft blocks in each level also hides the warp panel; touch it after defeating all your enemies and you’ll move on to the next level. After each set of five levels, you’ll encounter one of three mini-games: Bowl for Bombs, in which the pins are bombs that explode only when touched; Bomb Buster, a matching game that requires you to touch the bomb with the same color as the one in the center; and Bomb Rollin’, in which Bomberman must jump from one rolling bomb to the next, getting to the end of the track as fast as possible. Clear a mini-game to earn an extra life. If an enemy is coming toward you, and you place a bomb in the same space they’re occupying at that moment, they’ll pass through and continue on their current path. Better hope you’re not headed toward a dead end, or another enemy.